Last Friday was annoyingly cold, and damp. Combinations of subdued, rich colours always give me the most pleasure - but it felt particularly appropriate on a day like this. The textures of the three pieces also went well together: the fuzzy surface of a serge trouser, fluffy cashmere knitwear, and a matte cotton-twill jacket. The trousers are those featured last week in my recent commissions from Whitcomb & Shaftesbury. Their texture is a result of the cloth's weight and short-haired woollen yarn (despite not being milled, like flannel). The knitwear is a lightweight polo-collar cashmere/silk model from the Anderson & Sheppard Haberdashery, which is soft and lightweight. (But could be a little slimmer in the body - I wear a small). And the Travel Jacket, also from the Haberdashery, is a heavy cotton that is smoother than the other two, and a nice foil to them with its muted grey/brown colour. When I posted about the trousers, readers asked what I would wear them with, given I don’t usually wear navy trousers with sports jackets. This A&S jacket is a great example - something well made but not tailored, which could have been worn with chinos but is dressed up considerably by having these on the bottom half. It’s a point I’ve made before, but bears repeating: a well-cut formal trouser is a really effective way to dress up an otherwise casual outfit. I wish more guys that don’t have to wear tailoring to the office would consider something like this, or flannel, with a casual jacket on top. It works equally well for tailored linen trousers in the summer. The jacket, by the way, really needs to be tried on and worn for a few minutes to be appreciated. The heavy drill-cotton is wonderfully reassuring and comfortable - as only cotton can be. It feels like it moulds to the body. It’s not quite as practical in the rain as a wool or waterproof, but it should also wear in nicely. The main reason I’ve hung back from getting one of these A&S travel jackets is the price. At £1750, they’re surprisingly expensive. They’re made in Italy, in a great cotton and with matte horn buttons - but the biggest reason for the cost is the huge number of bells and whistles. I think there are 15 pockets on the whole thing, but I may have missed one. 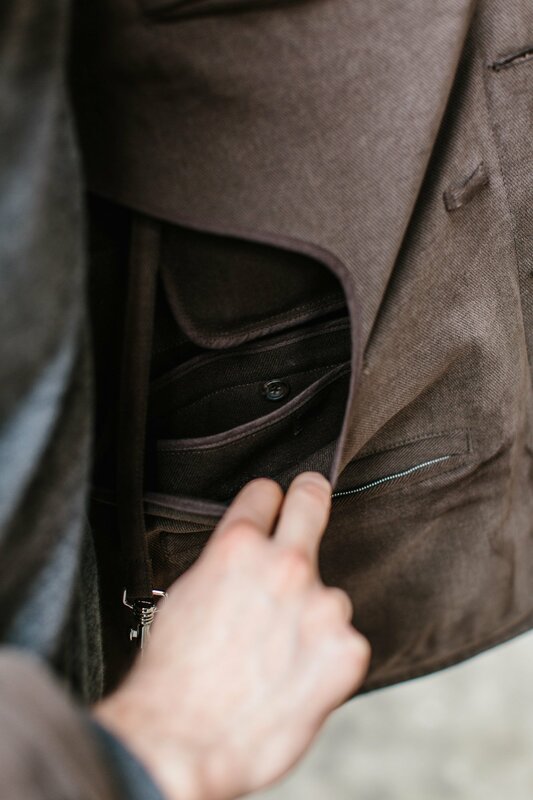 On the left hip alone there is an external patch pocket, with internal card pockets, a plunge pocket behind that, a zipped card pocket on the inside, another buttoned large pocket in the lining, and a space for keys on a strap behind that card pocket. You can see the last three in the image above. It's insane. Yet the total effect is not bulky - unless you fill them all with stuff. I’d highly recommend it, and there are other colours as well as some in corduroy, but you may have to fall in love with it to justify the price. You can follow the discussion on Travel jacket, knitwear and serge trousers by entering your email address in the box below. You will then receive an email every time a new comment is added. These will also contain a link to a page where you can stop the alerts, and remove all of your related data from the site. I know what you mean about the jacket. It genuinly is a thing of beauty but I did nearly drop it on the floor in shock when I looled ay the price tag. Even by A&S standards it is pretty eyewatering. Great looking outfit and something I’d wear (or at least the more affordable equivalents). I appreciate from a photography point it’d be difficult but given the general focus on bespoke it’d be great if there could be a touch more focus on the forthcoming season than what to wear “today”. The trouser fabric post was a good case in point as almost all were winter trousers which hopefully will be going back in the wardrobe now and if commissioned later in the year to be ready for Autumn theres a fair chance the fabrics wont be available any more. For me at least more of a focus on summer fabrics (as per the jacket post) would have been more useful to give inspiration of what to commission now for the coming season/months. I like it a lot but the price is just absurd… also who needs that many pockets. 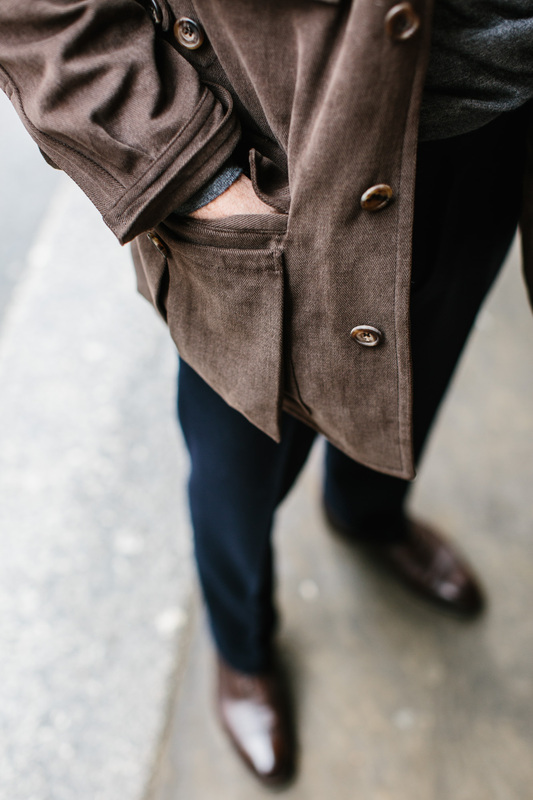 A regular field jacket or even safari jacket has a sufficient number of pockets…..
Nice jacket. Particularly like the colour and the matt texture of the cloth. The price though… Wow. Although I guess all those pockets would come in handy for storing maxed-out credit cards and angry letters from the bank manager! Love this combination. Thanks for the clarification on the A&S jacket, I too had been scratching my head on the price, but it looks fantastic in brown and a really substancial piece. In 15oz cotton do you think it is too heavy/warm for a ‘travel’ jacket. I always think of travel jackets as being a bit lighter (linen/cotton) but maybe my association is being in an airport, going to a warm climate, rather than all round travel! Which is the first garment you’d normally start building any days’ outfit with? For me it’s often trousers but that’s more an effect of that being a bottleneck in my wardrobe. An extended question would be, in what order do you usually put on/pick all parts of an outfit? Do you make up your mind days in advance or is it a creative process every morning with no formula to it? Your position on navy trousers is a bit simplistic Simon. How can Corduroy, moleskin, chino, ( I could go on) look like one half of a suit? Navy flannels with tweed? Fantastic idea. Is it just that you don’t know yet? Plus charcoal is a shade of grey; they are not different colours. My goodness you are not always right of course!! True, but I still find it applies to navy across different textures. And I generally wouldn’t recommend navy flannels with tweed to be honest. Simon come on to style learning! Navy flannel, dark brown/green tweed. Of course and grey also!! But the blue is less cold and has more interest. We blend my 40 years style learning with your 10 and it arrives to 50!! Interesting, thanks. I’ll stick with no navy but happy to be proved wrong! Herve sounds like an interesting newcomer to the blog, and if he’s got all that experience may be worth listening to. Could be the start of an Anglo-French discussion on Style, which could be enlightening. What is it Simon that makes you so negative about blue trousers with an odd jacket? Hey Josh. Absolutely, great to have that input. It’s covered largely in comments higher up. While Herve’s suggestion of navy flannels with tobacco shoes might not seem like such a great combination in my opinion, I think he has a point. Navy chinos with a casual gray jacket look great. More importantly, what is fundamentally wrong with trousers looking like part of a suit? Do you think it matters that much? Cheers David. I don’t include chinos in the navy odd trousers – they are probably the most useful colour of chino. On the suit point, in general when picking a cloth for an odd jacket or odd trousers, a key thing to avoid is either looking like one half of a suit. It’s the reason it rarely works when guys just start wearing the jacket of their suit with different trousers. Simon, you mention this as a good choice for the office: in your opinion would it be fine to wear a jacket like this indoors? Cracking jacket. Love the style and colour. Can I ask, are you wearing oxford boots? Would you ever wear such boots in summer? I’m finding myself wearing boots more and more. That jacket is lovely…. but what a price. For the same money you (and your loved one) could have a night or two in Barcelona and go and commission a nice Teba jacket. Not the same thing, sure, but similar usage I imagine. I don’t think we’ve ever seen a Teba on here? No – I actually had one made at Burgos back in 2012 (shop post here) but didn’t wear it much – it was in a tweed, which was probably the wrong material. The A&S jacket, though, is obviously rather different in cut and style, buttoning all the way up and with a short collar. More a workwear design. Looking to get rid of your teba? I’m the same build and would blooming love a tweed one! Nice post and a nice jacket! However, is there any any other jacket more affordable which you would recommend (e.g. perhaps the the Desert jacket from Private White)? Would be grate if you could, thanks! 2-3 alternatives at a lover price range would be sufficient. thanks! Hi Simon… Reviving this old thread to ask whether you think the new Twin Track by PWVC (non wax) could be used similarly to this AS jacket? Thanks! Got it, thanks. I would have thought that the waxed version would be significantly more “casual” than the AS jacket, wouldn’t you say so? Yes I can see that. I guess waxed jackets are worn so often with tailoring these days that it doesn’t seem that way anymore. Simon, this is one of your better recent outfit combinations. That jacket is fantastic, particularly that grey/brown color. The idea of wearing a nicer pant, such as flannel, as part of a more casual ensemble is terrific and one that I’ll implement immediately. 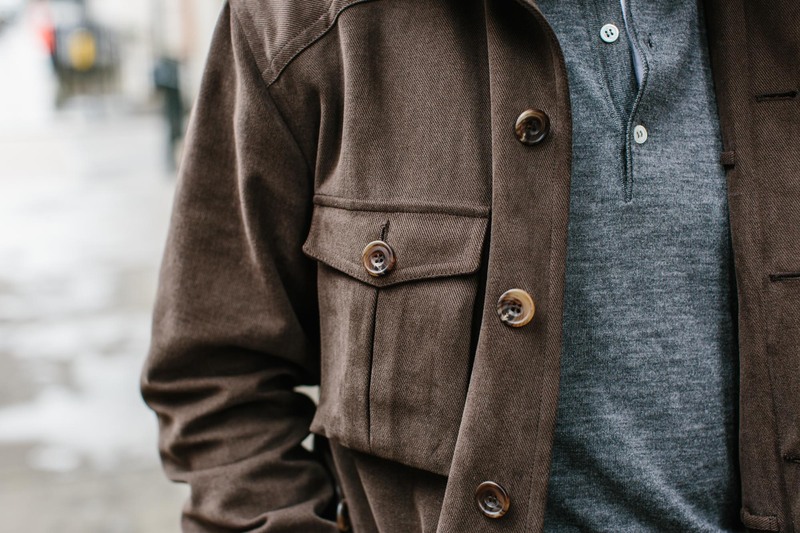 Simon – what are your thoughts on versatility of chocolate brown vs navy color? I have a similar Tom Ford cotton jacket (less pockets) in green that is my absolute favorite out of the office. I’m looking at this AS to complement for days when I’m wearing something that does not quite work with green. Sorry but what size is the A&S jacket? Not the focus of the post clearly, but the orange ostrich band on your Jaeger LeCoultre is just great. I had thought it was pigskin until I noted your remarks. 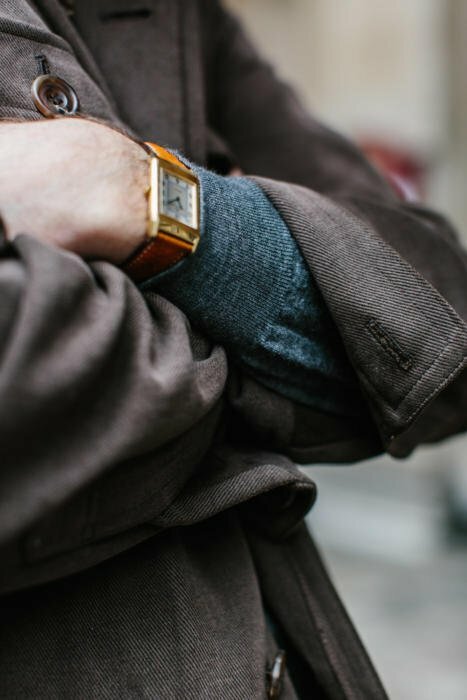 Do you have a “theory” on high contrast bands and would you care to reveal the approximate date of the watch (I believe it is vintage based on a prior post) and the source of the ostrich band? I would generally only wear contrast bands in fairly natural colours, like this. Not bright reds etc. I love this A&S jacket and have pondered it many times. My principle problem with it is not the price, albeit it’s not cheap, it’s the fact that it isn’t waterproof or water resistant. Compared to my old Loro Piana traveller it is just less versatile. If you are going to travel with a jacket like this, either in cotton or cord, you’d have to be damn sure it’s going to be dry and that’s a very limiting factor. Sad because I’d really like to find a reason to buy it. The styling and quality is superb. On the sartorial front Simon, I have to say, I don,t like T shirts showing like this, I really think it cheapens a look. Jason King would never have approved. May I propose a PS neck square ? Thanks for saying that. I assume you don’t mean advertorial as in something paid for, because obviously I don’t do that. But on expense, I do know what you mean, these are very expensive and don’t have the craft of bespoke. However, I don’t think the people that could afford this jackst are too dissimilar to those that can afford a £5,000 suit, and if anything they might need just the one casual jacket. I wouldn’t say it’s really a luxe fashion garment either – it is a classically styled piece rather than anything more fashionable and unusual. And unlike fashion pieces, most of the money here is still going into cloth and manufacture, not design. A word in defence of A&S. As a regular customer, I would say their prices are “ correct”. Of course they aren’t cheap and they are much more, thank God, devoted to classic style than fashion. The quality of many of their pieces is at the Loro Piana level and within that context, their pricing is entirely reasonable. Their service and commitment to their customers is also off the Richter scale . Unlike their Bond Street Eurocrat competition. A & S forever ! A very interesting post! 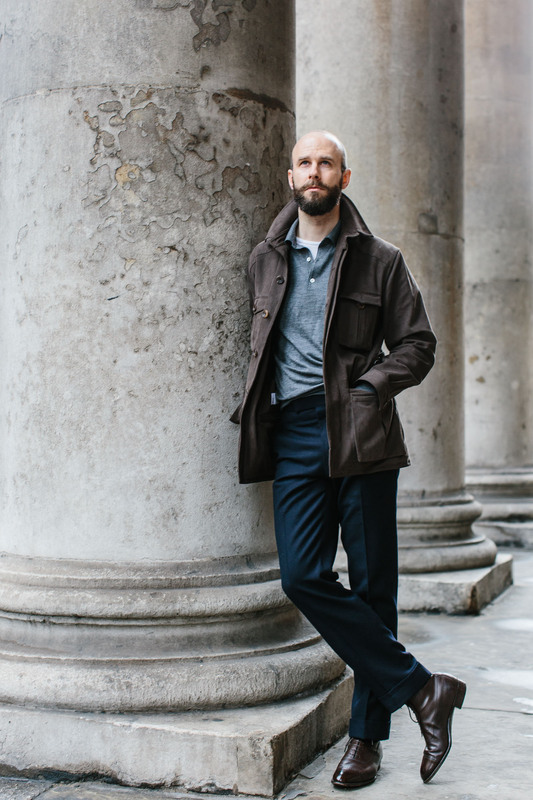 You have succeeded in dispelling my misgivings about stand alone smart navy trousers. Within this outfit, it works well indeed! This might be the exception, perhaps! But I still wonder why you have chosen Serge instead of any heavy weight alternative fabric. Sorry that this does not relate directly to the post. I am on the short side (5’7) and was wondering whether you know of any brands in the UK that specialises in clothes for the shorter man such as Peter Manning in the US? A few of my friends are even shorter than me – in the 5’3 to 5’7 range and also have the same question. I am thinking more about basic casual clothes such as casual shirts and jeans and in terms of budget, around the £40-£60 mark per item. Have you ever worn it over a suit or similar? 1. Would you wear it with jeans? 2. What is the warmest temperature that you would wear it in? 1. Just about, but it’s better with tailored trousers I think. 2. Warmest? I haven’t tried it, but perhaps 15oC? Interested to know your opinion on the serge fabric now you have had the chance to wear it. Would you recommend serge for trousers? Thanks Simon, appreciate the feedback.